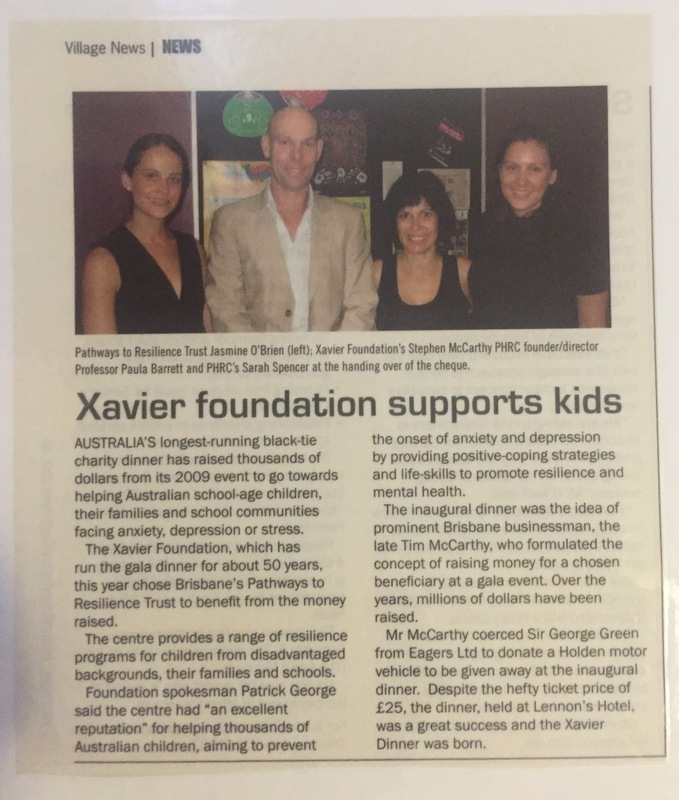 This is an article about how the Xavier foundation supported the treatment for kids done by Dr Paula Barrett. “AUSTRALIA’S longest-running black-tie charity dinner has raised thousands of dollars from its 2009 event to go towards helping Australian school-age children, their families and school communities facing anxiety, depression or stress. The Xavier Foundation, which has run the gala dinner for about 50 years, this year chose Brisbane’s Pathways to Resilience Trust to benefit from the money raised. The centre provides a range of resilience programs for children from disadvantaged backgrounds, their families and schools. Foundation spokesman Patrick George said the centre had man excellent reputation’ for helping thousands of Australian children, aiming to prevent the onset of anxiety and depression by providing positive-coping strategies and life-skills to promote resilience and mental health. The inaugural dinner was the idea of prominent Brisbane businessman, the late Tim McCarthy, who formulated the concept of raising money for a chosen beneficiary at a gala event. Over the years, millions of dollars have been raised.